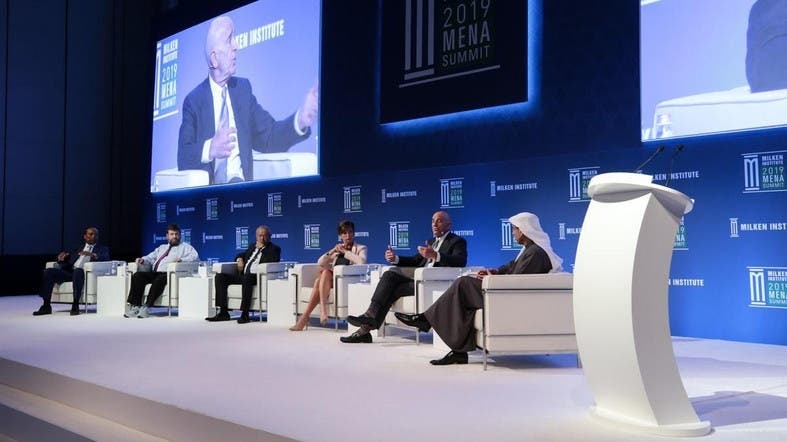 The Milken Institute opened its two-day MENA-focused summit in Abu Dhabi on Tuesday featuring a host of local and international speakers, from health chiefs to philanthropists as they discuss regional challenges. In its second year, the summit is focusing on youth unemployment, environment sustainability, and the refugee crises. The Milken Institute is a nonprofit, nonpartisan think-tank mandated to increase global prosperity by advancing collaborative solutions that widen access to capital, create jobs, and improve health. “We’re in the region because it is going to continue to be a key and important part of the future growth of the world economy,” Michael Klowden, CEO of Milken Institute, told Al Arabiya English on the sidelines of the summit. “Our goal is to bring together leaders from the region and elsewhere in the world to compare ideas and see what people can do to come up with innovative ways to advance the progress made and that the leaders in this region hope to make in the future,” he said. Klowden said the Middle East has and will continue to be seen as a source of capital. He, however, said that outsiders are now viewing opportunities to invest even further as the region is improving in dealing with human capital. “Financial capital is also very important but the human capital; education, health, and population are also important key factors for the growth of the economy,” Klowden said. “As people see developments taking place, they feel more comfortable looking to invest,” he added. This year’s summit will host 150 speakers in over 45 sessions split between private and public panels. The key questions to be addressed at the summit include regional workforce’s ability to adapt to technological innovations and how oil price shifts could influence the region’s commitment to economic diversification. According to Klowden, issues such as biodiversity, food security, innovation, infrastructure, gender diversity and opportunities for inclusion are all important for the region and will be discussed at the summit’s private sessions. They will also be part of public sessions open to the public. The Milken Institute’s CEO also spoke of the uncertainty Brexit brings to Europe and how the China-US trade war might impact global economy. “There’s no question that if the dispute between the US and China escalates and the Chinese economy continues to go through periods of slowing down, that is going to have an impact on the global economy,” Klowden told Al Arabiya English. “The uncertainty is Europe; the economy is barely chugging along. Brexit is a big overhang, no one knows how it is going to play out in terms of the impact on the economy, if it will take place or it doesn’t, again it’s a significant impact,” he added. More than 1,000 officials, academics and world leaders are scheduled to attend the two-day summit with billionaire entrepreneur Richard Branson and American technology guru Sean Parker attending the first day as guest speakers.